This recipe was Drink of the Week on 2006-03-03. Check out the review! Build over ice, stir, and enjoy! 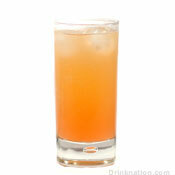 This drink recipe was submitted by one of our magnificient readers, Brian808! There aren't any comments for Island Breeze yet. Why not mix one up and be the first to leave your thoughts?